Gothy News :: Edinburgh Goth Scene EXPOSED!! Said to be one of the most chilling theatrical experiences you can expect, this notice includes a special offer made specially available to list members and all readers that access this message on our extended lists courtesy of the Festival City Theatres. Plus Student or under 26? Get the best available seats for £10. Student / Young Scots Standby details below. Unanimously acclaimed by the critics, Stephen Mallatratt’s adaptation of the best selling novel by Susan Hill combines the power and intensity of live theatre with a cinematic quality inspired by the world of film noir. Prepare for an evening of unremitting drama as you are transported into a terrifying and ghostly world. 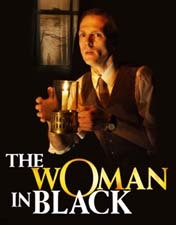 Now in its 21st year in the West End, join the 7 million people worldwide who have lived to tell the tale of The Woman in Black - one of the most chilling theatre events ever staged. Feeling brave? Save up to £9 on the fright of you life! Get stalls tickets for just £17.50 for all performances. Simply call 0131 529 6000 and quote “Spooky offer” or book online at http://www.kingstheatre.org.uk using discount code SPOOKY. Offer subject to availability, not to be used in conjunction with any other offer, not valid for tickets already purchased, booking fee applies. Offer also available in person at the Festival Theatre Box Office, 13/29 Nicolson Street, Mon – Sat 10am – 6pm or at the King’s Theatre Box office from one hour before the performance. Student or under 26? Get the best available seats for £10. Student and Young Scots Standby ticket is available from midday on the day of the performance from the Festival Theatre box office and form the King’s box office from 1 hour before the show. Subject to availability, ID required. Presenting, a night of circus themed, music theatre. Gig & Club Event: Thursday 05th November 2009 7.30pm. Bands Psydoll, Metaltech; A Burlesque; Art, Music and DJ's by the Come Collective. Edinburgh. Thursday 05th November 2009 7.30pm. A Taste of 'Come,' Club :: Come Club DJ's and Art Collective. n.b. Times may vary slightly so be at the Ballroom by 8pm to see the whole show. Self-harm researcher says "Most self-harmed before becoming a Goth, suggesting they chose the subculture because they felt their emotional distress would be understood...."
Goths 'more likely to self-harm?' Self-harming is a strategy for coping with serious emotional problems Teenage Goths are more likely to self-harm than those in other social groups, a study has found. - it must be true, a vampyre researched and wrote it up! This story contrasts with the latest GOTH RESEARCH by Dr Dunja Brill. Do you have something to publicise?